This list of Pilgrimage Site are the Verso Ministries Top Pilgrimage Sites in Region 12. The Regions that will be used for all of our lists are based off of the Regions used by the National Federation for Catholic Youth Ministry (NFCYM) and used for the Bishop Conferences. These resources are here for Youth Groups, Young Adults, and Individuals to be able to find local sites to go on Pilgrimage to. The Shrine of Saint Therese began as a dream of a Jesuit priest who in the 1930’s had a desire to create a retreat center for the people of Alaska. Gaining the blessing of the Bishop, who made the priest promise to name it after St Therese of Lisieux, work began in 1932 until the first Mass was said in 1941. The Shrine has seen its own share of struggles, having had to close its doors twice before the local Catholics banded together to save it on both occasions. Being hidden away on an island, the Shrine can only be approached on foot via a causeway that was built up for that very purpose. But once you do make it across to the island, there are a number of beautiful prayer options at your beck and call. The Chapel itself is at the heart of prayer on this island and is definitely a spot that you should take some time at. However, there are also a Stations of the Cross trail and Rosary trail that go through the beautifully wooded shoreline of the island. This first spiritual hub of Alaska is a pilgrimage worth making for any Catholic that finds themselves in the Juneau area and I strongly encourage you to make a trip yourself if you ever get the chance! On the eastern edge of Portland is the National Sanctuary of Our Sorrowful Mother. Known for its incredible Grotto and beautiful gardens, this Shrine finds itself on our list because of the gift of beauty it provides to the city. Filled with shrines, statues, and even a monastery, these gardens are undoubtedly a holy site. However the heart of the Shrine are its beautiful Chapel of Mary which is reminiscent of the small chapels across the Italian countryside and the Grotto of the Sorrowful Mother which hosts a stunning sculpture of the Pieta (Mary holding the body of Christ after he has been taken down from the Cross). During your pilgrimage here, I strongly encourage you to find as many little prayer sites as you can. Of course you will make time to visit the Chapel and Grotto, however the gardens also offer some beautiful opportunities for your prayer. So find some solitude while there, enjoy the beauty of creation within all that surrounds you, and make sure to enter into this time with God, appreciating the opportunity this is for you to find solace with Him. The Our Lady of Perpetual Help Shrine is hosted within St George Byzantine Catholic Church. The Image of Our Lady of Perpetual Help is thought to have been originally made by Saint Luke the Evangelist before being handed on to his dear friend Theophilus and on to other Christians after him before being brought to live in Constantinople around the 5th Century. It was then held on display there until it disappeared in 1453, but fortunately so many copies had been made by then that the image has lived on to this very day. Being the source of many Graces and blessings, the image of Our Lady of Perpetual Help is venerated by so many people throughout the world as the worries of all people are placed at her feet. I would strongly encourage anybody who lives near Olympia to join in on the annual weekend long pilgrimage that the Parish hosts at the end of the summer. It is a blessed pilgrimage in which you and everybody else partaking in it is able to bring their petitions to Mary’s feet in hope and trust that she will bring them to her son to be answered. The image of Our Lady of Perpetual Help is a special icon and the one on display in St George is even more special than most so if you have a Marian devotion and live in the Pacific Northwest, you need to go on this trip! As on a couple of our other Top-5 Lists, we find another one of the most amazing National Parks in the United States. Grand Teton National Park is home to one of the most stunning mountain ranges in the world as the Tetons just seem to take over the entire skyline of the park. With over 200 miles of trails, Snake River, and many mountains to climb, your pilgrimage to the Grand Tetons can be found in the spirit of Pope Saint John Paul the Great. Just as the great Saint would lead groups on spiritual trips through the mountains of Europe, so to can you go into Creation to find God. Go spend a week of pilgrimage within the quiet of the outdoors. Bring your Bible, journal, Rosary, Breviary, and anything else you need for this trip! If you can, bring a priest along with you so he can say Daily Mass for your group as well as lead you all in spiritual exercises as you backpack through the mountains in front of you. So go out into the world and find the Lord within His beautiful Creation as you try to reach the top of the Grand Tetons! 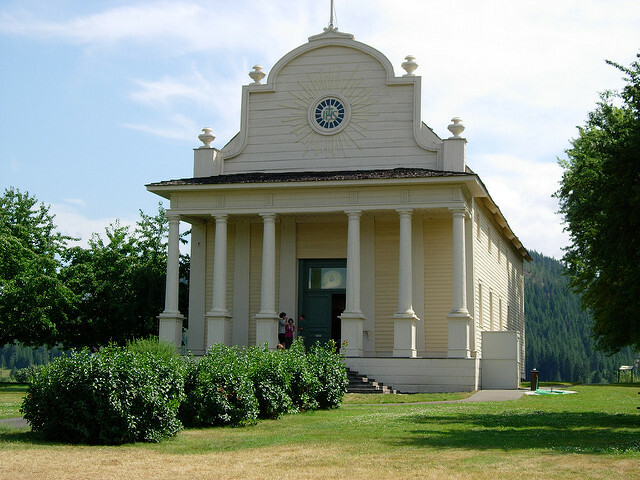 Old Mission State Park is the home of the oldest building in all of Idaho, the Mission of the Sacred Heart which was built in 1853. The Mission was founded by Jesuit priests who had traveled into the western territories of the United States to evangelize all who live there. You can learn a lot about that story in the parks “Sacred Encounters Exhibit” which details the meeting of the Native Americans in Coeur d’Alene and the Jesuit priests who brought the Gospel message to them. At the center of it all is the Old Mission Church which while now being a historic monument, is still a Church that one can make a pilgrimage to. So come to this site and experience the history of the Catholic Church in Idaho. We are only here in our faith because of the missionary work that began it all, and so it is only right that we honor that with the pilgrimages we embark on. Follow the footsteps of these Jesuits that gave it all up for this mission and you will find a true blessing in your own faith life.